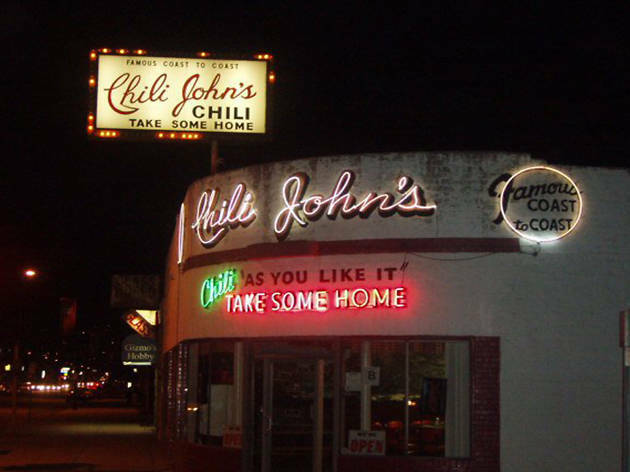 There's a certain sense of nostalgia that permeates your experience at Chili John's, whether this is your first time here or the millionth time you've ordered a bowl of chili from one of the amicable servers behind the bar. Red bar stools, neon fixtures and plaques touting the restaurant's achievements (and yes, that episode of Diners, Drive-Ins and Dives) give this place an old-school vibe, but it also opened in 1946, so it's pretty old-school anyway. When ordering, choose your chili type—beef, chicken or vegetarian—then a style, which includes chili served over beans and rice, spaghetti or simply spooned into a bowl. There are also chili dogs, sandwiches and homemade tamales, but first-timers would be wise to order a bowl of the good stuff—and top with a heavy dosing of cheese and sour cream, of course. Sick of pretentious neck beard lunch spots? Want to travel to a time when Burbank wasn't run by studios? Want to meet actual LA locals? Go to Chili John's in Burbank! This establishment has been around since 1946 and doesn't look a day younger. This counter top service restaurant does what it says. Chili. Turkey, Chicken, Beef and Vegetarian. All phenomenal and served of your choice of spaghetti or rice. Its spicy, filling, and doesn't give you the meat sweats after. 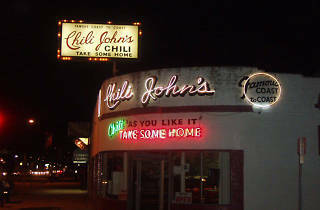 Chili Johns is a charming blast from the past and a great quick lunch spot if you're in the valley!